Parents and educators have an opportunity to use the latest data like these to challenge young people’s misconceptions and promote a culture of knowledge about drug use and its effects. It’s time to shatter these myths about drugs and alcohol to help teens make choices about their health based on the facts. 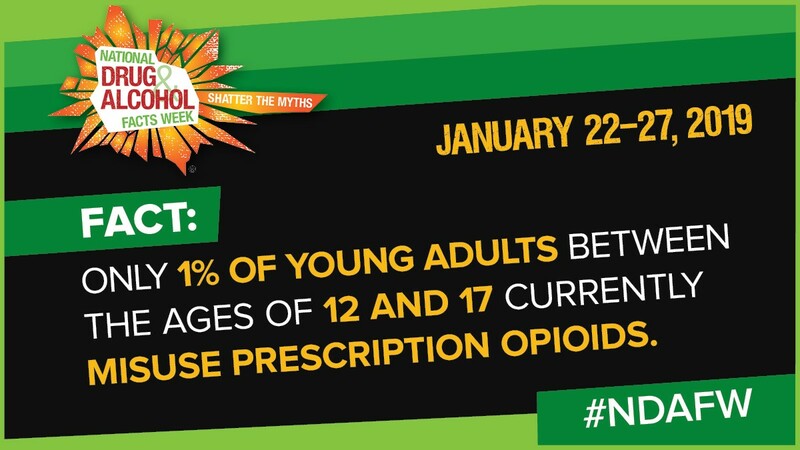 Join Informed Families for National Drug and Alcohol Facts Week® (NDAFW), January 22-27, 2019, to help educate youth about the consequences of drug use on their brain, body and behavior. What is National Drug and Alcohol Facts Week? Coordinated by the National Institute on Drug Abuse (NIDA) and the National Institute on Alcohol Abuse and Alcoholism, NDAFW is a week-long health observance dedicated to providing youth with the science-based facts about how drugs and alcohol affect the brain, body, and behavior. During NDAFW, thousands of communities and schools hold events that give teens the opportunity to learn the scientific facts about drugs and alcohol, using NIDA’s free materials designed for teens. [INSERT YOUR ORGANIZATION’S NAME] encourages you to plan fun educational activities or events for youth in your community during NDAFW. Share NDAFW messages and images on social media (be sure to use the official hashtag #NDAFW). Post videos of youth sharing the facts about drugs and drug use on Instagram, Facebook, or Twitter. Give students the IQ Challenge to test their knowledge on drugs and alcohol. It’s easy to get involved! Simply register your event online to link up with more than 2,000 other NDAFW activities and events. If you need assistance or answers to questions, NIDA staff are available to help you plan a successful event. You can contact Brian Marquis at drugfacts@nida.nih.gov. Be sure to check out teens.drugabuse.gov/ndafw to learn more.